Guided hiking and forest bathing experiences in the Beautiful parks around Victoria & Sooke. Backpacks, lunch & transportation included. With backpacks, water bottles, a healthy trail lunch and transportation provided, all you need to do dress for the day and meet your guide at your front door. You'll leave the city far behind and immerse yourself in the natural wonders that surround Victoria. You can pick one park and have the chance to explore it in depth, or split your time between multiple parks to experience more varied ecosystems. Beaches, lakes, and summits, see it all in one amazing day. For those with a little less time on their hands, we have a half-day option. There's usually only time to see one park with a half-day, but your guide will plan the adventure with you to ensure you get the most out of your time on the trail. We'll even drop you off at your next planned activity if you are pressed for time. Dinner and a movie is so overrated!! With this option, your guide will hike you to a postcard worthy look-out, and set you up with a few blankets, light snacks, a hot beverage, and then give you some privacy while you enjoy a golden west-coast sunset from your own slice of paradise. ​Let me know how much time you have, what you would like to see in the region, and how challenging/strenuous of a hike you can handle. I'll give you a few options to choose from and you pick the route that sounds most appealing. 20% Discount on tours for 2-4 guests if Pick-up and Drop-off in the Sooke area!! Lessen your carbon footprint on the ecosystem you're about to enjoy and ride in style with Tesla Tours to and from your guided hike! With this option, we can plan you a hike that begins and ends at different trailheads, rather than making our way back to the same place we started. You'll get to experience more of the park with an "A to B" hiking route, and you'll be cruising the forested backroads in the smooth, quiet luxury of a fully electric Tesla. Tesla Tours would be happy to show you some of the other hidden gems around Southern Vancouver Island before or after your hike. Book early to plan an incredible custom package. Together, we can create an amazing full-day experience that is sure to be the highlight of your vacation! "Ryan was a fantastic guide. We enjoyed a long conversation with him throughout the tour. He's very knowledgeable about the area. Everything from plants to wildlife to history of the area. He was very attentive to our abilities as recreational tourists and he introduced us to meditation in a way that made us really enjoy it and feel confident in continuing it on our own should we wish to. I think we will. Thanks Ryan! We look forward to future hikes with you." "It has been a really great experience. Ryan is so nice and interesting. We've appreciated a lot how Ryan embarked us during this hike and meditation moment: very calm, affable, sharing his knowledge and giving us some space also. And the hike is absolutely beautiful, all along the river. Thanks again Ryan!" "I just spent the most amazing day on a guided hike with Ryan LeBlanc and a couple of my friends. Ryan had EVERYTHING prepared for our day - a pick up and drive to our destination and back; our own backpack each with water, the most delicious healthy lunch all from local sources, safety supplies; a hiking spot that was chosen specifically to match our group's interest and abilities; a perfect spot to eat lunch on top of a mountain overlooking the ocean towards the Olympic Mountain range; a guided meditation after lunch.....it was a soulful, heartwarming experience full of great conversation, laughter, ease and flow. I highly highly recommend Ryan's "Natural Connection" guided adventures for couples, locals, or visitors from out of town, or as unique birthday/wedding/holiday/etc gifts for nature lovers of all ages, sizes and abilities. Ryan will find the perfect spot for your adventure into nature! Thank you so much Ryan - loved our day!!!!" ​"I booked this hike last minute and I am so glad I did, Ryan was an amazing host and tour guide. He's a true local who's very well educated in all that nature has to offer. I learned so much on this hike about the potholes and the different types of plants that are native to the area. The meditation was calming and the snacks were a bonus. Thank you for sharing your knowledge with me and I will definitely recommend booking with him and his amazing tour company. All the best Ryan and good luck with the adventures." "Forest bathing, based on the Japanese concept of Shinrin-yoku, seeks health bennifits from mindful time in nature. You're in good hands with outing leader Ryan LeBlanc, who is Coast Guard trained, well versed in local flora and has never owned an umbrella. 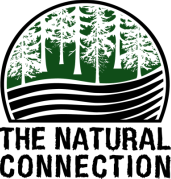 You might begin your hike at Thetis Lake with a series of stretches before finding a mossy rock to sit on (Foam pad provided) for a guided meditation to attune your senses to the elements." "What a great hike at Sooke Potholes this evening and such a spectacular place to learn about bears. We learned so much from Ryan who clearly has years of experience, a lot of knowledge and presents it all in such a warm and friendly manner. He clearly respects wildlife and loves this island we are lucky enough to call home. If you are looking for a great hike or to learn something new, I recommend giving Ryan a call." ~ Facebook review from - Linda H.
​"We went to the Tea in the Trees and it was an exceptional day. We had a three-hour walk through the beautiful natural park which the guide interpreted. The walk is challenging in places so you need to be physically fit. Although we had a child in our group, she did only the first, easier part of the walk then returned with her mom to the start. Halfway we were given a break with scones and tea, sitting in the wild while overlooking a lake. The tea was made with the dried leaves of plants found in the area. Very nice! Afterward we had appetizers and drinks in the lovely restaurant." 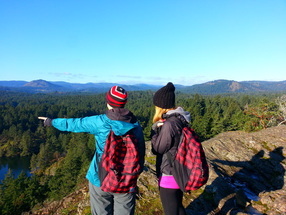 "Hiking in Victoria BC is a year round activity locals and visitors alike can enjoy. While I’ve done one standout hike in the area – the Coastal Trail in East Sooke Regional Park – I hadn’t spent any time in the regional parks closer to Victoria. That all changed when I hooked up with guide Ryan Leblanc from The Natural Connection. I was going to spend some time practicing Shinrin-yoku, also known as forest bathing. This was all new to me and while I didn’t expect to get naked, I really wasn’t sure how this would be any different from a hike in the woods. Right off the bat, I could tell that our first hike of the day – a loop around beautiful Matheson Lake- was going to be about the journey, not the destination. We started off with a good 5-10 minutes of stretching, something I never do. And then shortly after we started hiking Ryan asked me to pick up a rock and a pine cone. From there I was to transfer all my negative energy and thoughts to the rock and focus all the positive energy into the pine cone. Then I pitched the rock. I wish I could say all negativity has stayed out of my life since that rock went sailing through the air but it hasn’t. Still for the day I spent hiking with Ryan I really did focus on all that was right in my life, of which there is plenty. He did get me to focus on all five senses (even eating bitter berries) and I credit him for slowing me down so I was wholly in the moment. I also appreciated that much of our hike was done in silence so we could both really focus on nature." "One moment, we were in the dark forest. After turning a corner, we were back in sunlight, at the end of the Salish Sea. “Take a seat and get comfortable,” said Ryan, who started to guide our meditation setting overlooking the ocean. I peeked one eye open to catch a quick glimpse of my partner. Meditation isn’t exactly his thing, but he seemed pretty Zen in that moment. Next was smell, where we picked one scent to focus on, the crisp air, or salt spray, mud on the boots. Then touch, where we physically connected to the Earth with bare hands and focused on the wind on our face. Taste came later in the day with some delicious trail snacks from Glenrosa of fresh crostini, pickled beets, a variety of tasty cheese, homemade sausage, cured meats and a thermos filled with hot tea." "There are so many things occupy your time with while in Victoria. If you’re a nature lover, check out one of The Natural Connection‘s guided hikes. Led by Ryan LeBlanc, the company’s owner, you get to discover some of the most beautiful local hikes and point of views. 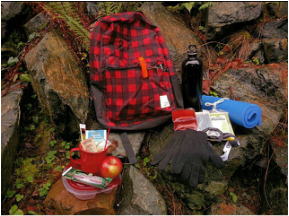 He comes equipped with a gourmet lunch and supplies for your hike. He is a super knowledgeable guide, who invites you to use all five senses when exploring the area. It’s a great way to discover all of the stunning scenery just next to the city."